It started 18 months ago when an autonomous truck packed with self-driving technology from Uber delivered a cargo of Budweiser beer from Fort Collins to Colorado Springs, 120 miles away. That was a Kitty Hawk moment for the autonomous truck idea, which is gaining speed rapidly as Uber, Waymo, and Tesla are now actively operating self driving trucks on public highways in commercial service. There is no official confirmation from Tesla that its electric tractors are using self-driving systems on the way from the Gigafactory in Nevada to Fremont, California, but it seems no one is more committed to autonomous technology than Elon Musk. It is a safe bet that the self-driving systems baked into the Tesla Semi are being put to good use, even if only in shadow mode. 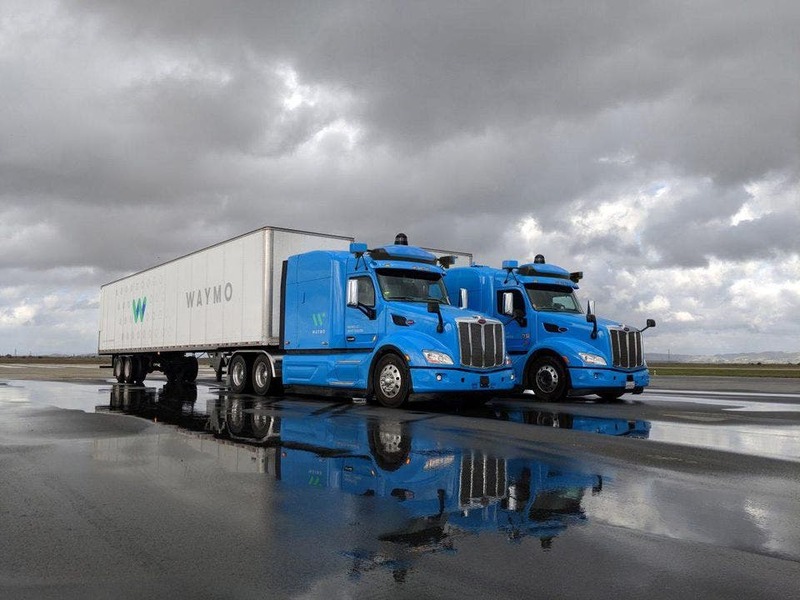 Waymo and Uber got into a legal tussle after former Waymo engineer Anthony Levandowski left Waymo abruptly at the end of 2016 to start his own self-driving truck company called Otto. Uber, then under the control of superjerk Travis Kalanick, quickly snapped up Otto and brought Levandowski in house. Waymo cried foul and sued, claiming Uber took advantage of trade secrets Levandowski downloaded without authority on his way out the door. That suit has now been resolved, the two companies have agreed to not use each other’s technology, and Levandowski is out of job. Kalanick has also been elbowed aside, meaning some sort of rough justice has occurred for both men. Elon Musk is famous for developing and testing new technology in beta mode. While work progresses on the Tesla Semi ahead of the start of production sometime in 2019, two of the electric tractors are now hauling battery packs from the Gigafactory in Sparks, Nevada, to the Tesla factory in Fremont, California. No doubt, they are collecting copious amounts of data along the way, information that will be used to improve and refine the Tesla Semi for paying customers. The approach is similar to the way the company provided the first Model 3 sedans off the assembly line to employees. That way, Tesla workers could drive them and report any problems directly to the factory before any cars were delivered to non-employees. It’s a clever way of doing product testing while shortening the ramp up period before full production begins. The significance of the Tesla Semi is more than the fact that it will be able to drive itself, at least on the highway. The real good news is that it signals the end of the diesel engine — the most highly polluting energy source since steam engines were powered by coal — as the backbone of the trucking industry. If replacing passenger vehicles with non-polluting electric cars is important to mitigating climate change, getting rid of those diesel-powered behemoths that spew megatons of nitrogen oxides and fine particulates out of their twin exhaust stacks every mile of the way is absolutely critical. Waymo and Uber may be leading the autonomous truck parade at the moment, but they will need to step up their game to include electric semis if they have any hope of competing with Tesla over the long haul. The celebration over self-driving trucks may be muted somewhat by predictions that up to 3 million truck drives may lose their jobs to robotic vehicles over the next several years. That is a lot of people who will be cast aside by the march of progress. The industry and government need to address their needs and concerns now, rather than just tossing them onto the discard pile. Unemployed people can have a dramatic impact on local and national politics, as America has learned to its sorrow in the Age of Trump.